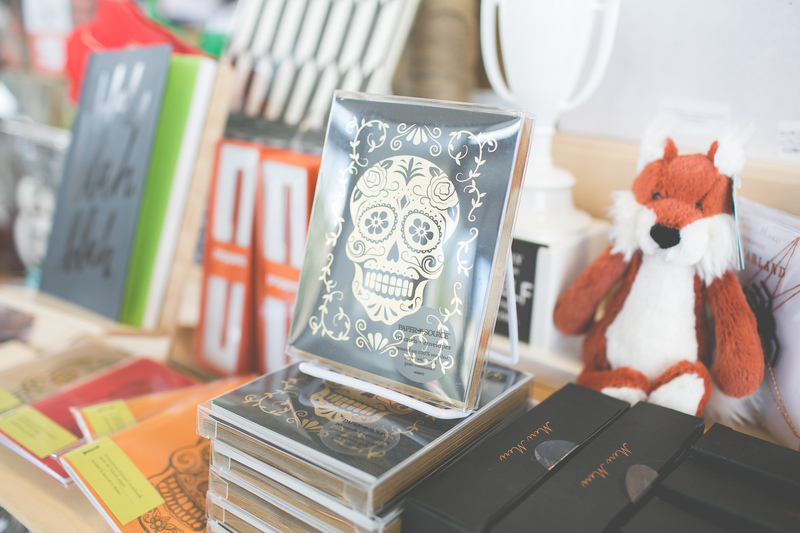 Shop over 60 local different vendors. 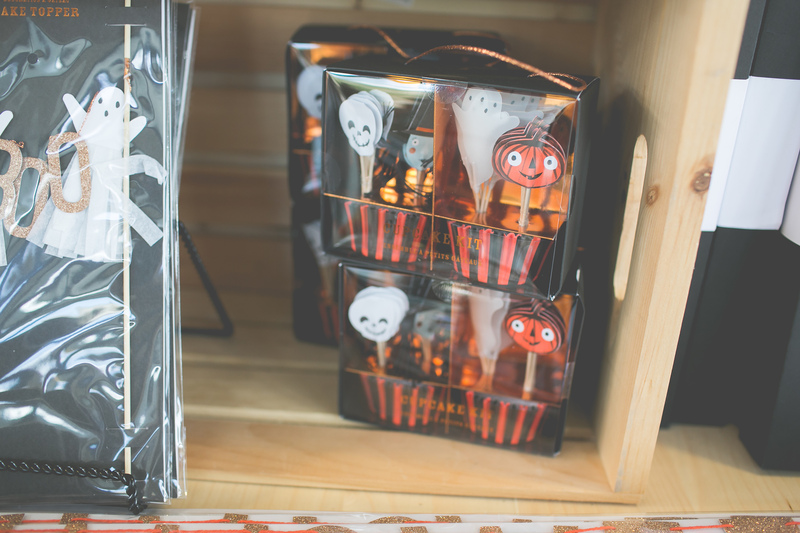 The perfect time for treating yourself, stocking up on some fall decor, or getting some early Christmas shopping done! Paperie + Pen (and some of the other participants) will giving a portion of sales to the Women’s & Children Alliance! Featuring Boise’s homegrown Hawthorne Beverage Catering Co. and a variety of locally based food vendors. 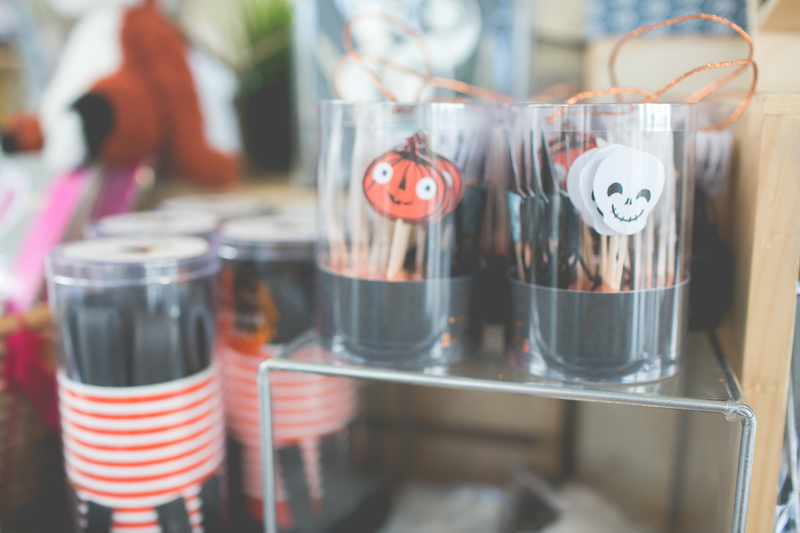 Don’t forget to grab some fall favorites such as seasonal wines, brews, and a variety of fall-themed eats. 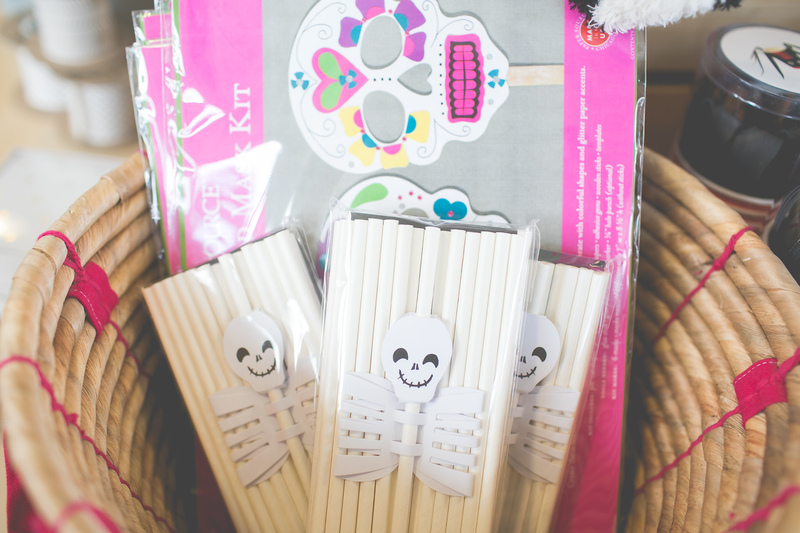 Our kids carnival will be featuring simple kids carnival games with a kooky whimsical twist. Games are available to play for donation. A great way to let the kiddos have fun and show some love to the WCA. Featuring local musicians, dance groups, and actors donating their time and talent to entertain and raise awareness of domestic violence here in the valley. Make sure to give em a smile and maybe a buck or two. A line up will be posted mid September. Make sure to stop by our prize booth! 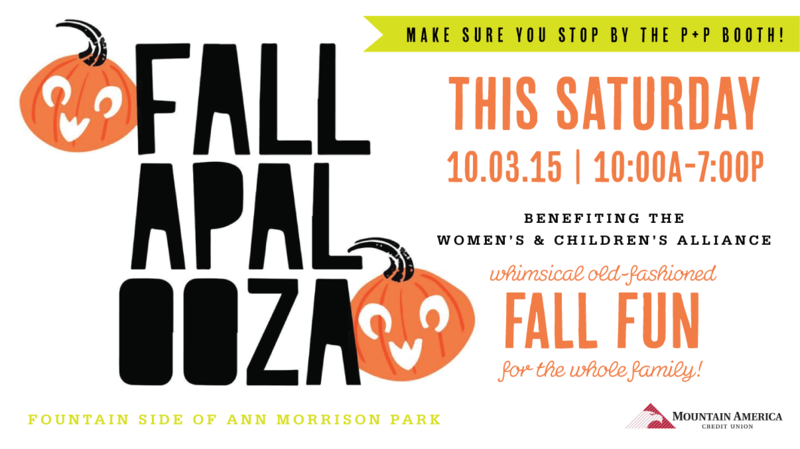 At Fallapalooza we are happy to encourage a positive relationship with pie for a great cause! Pie eatin’ will start at 2:30pm on stage. Spaces are available. Several volunteers and trained professionals from the WCA wil be present to talk about their outreach program, volunteer options, and more! If you’d like to discuss a personal issue, please ask to speak to a trained professional. We’ve gotten such a wonderful response from our Sarah Pearl workshops- we decided that we better offer more classes this winter! 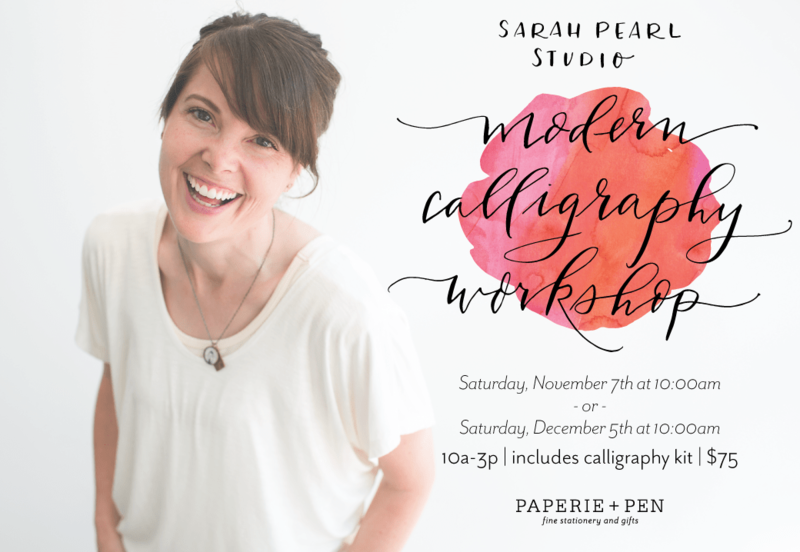 This is a beginner class for those who are ready to dive into the basics of modern calligraphy. 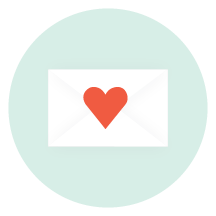 You will receive a workbook, pen holder, nibs, and a jar of ink to get started on your letter-drawing journey! Meet Lindsey! 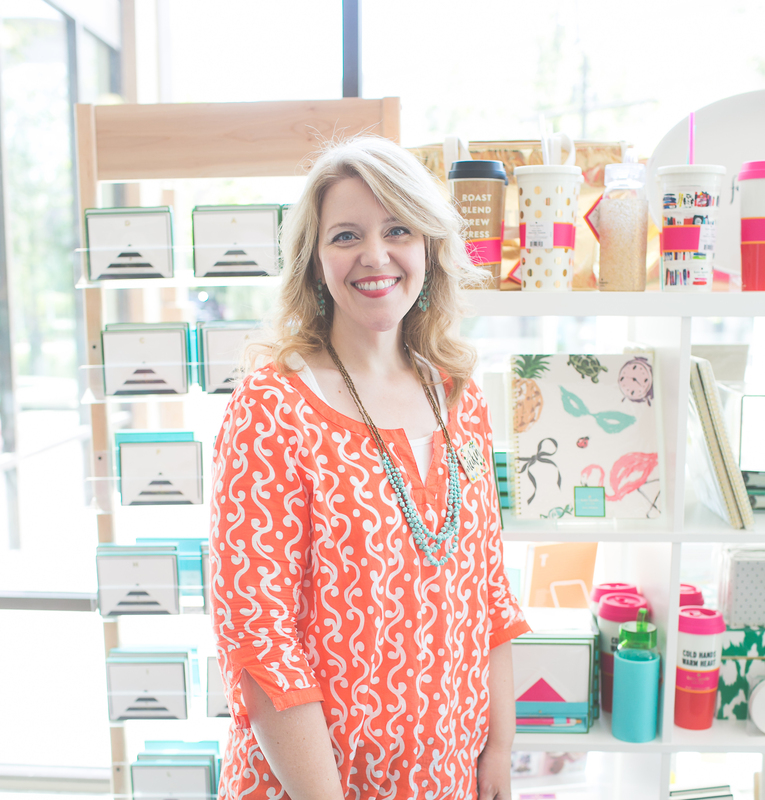 You may not see her on the sales floor much, she is more of our behind-the-scenes worker bee! 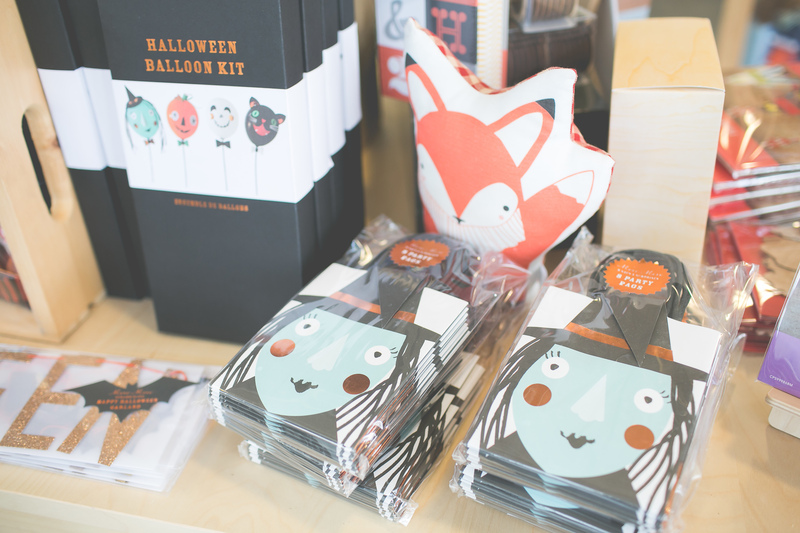 She helps us a lot with our custom invitation assembly and window displays. 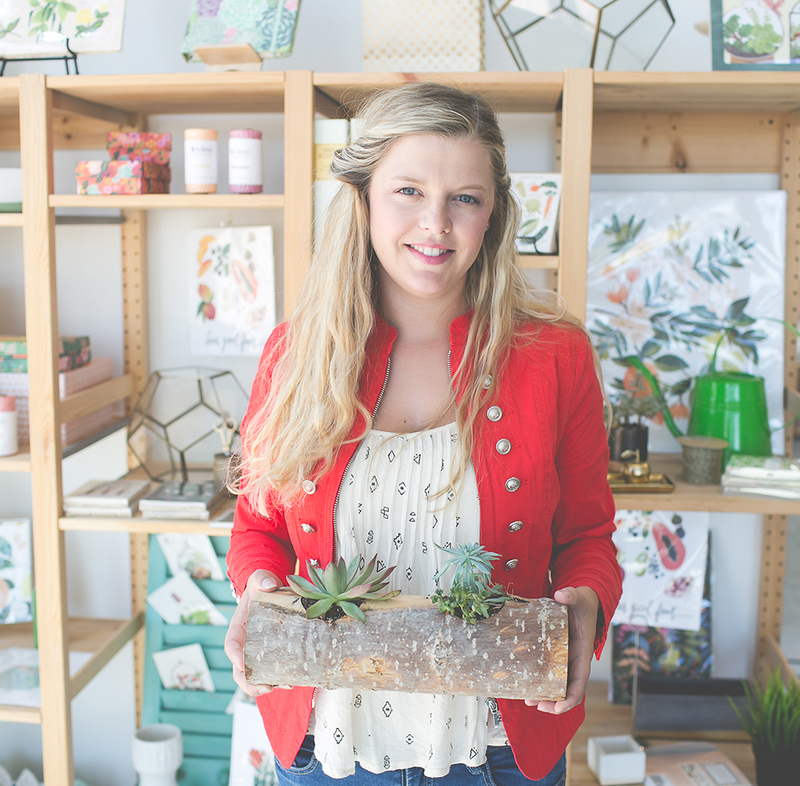 She is also the vendor for our super rad log succulent planters! When this busy lady isn’t ribbon-tying, paper-folding, and succulent-planting, she is a full time high school art teacher AND a mama of 3 of the cutest little girls in town (2 of which, are twins)! I have always been drawn to crafty creative projects from as long as I can remember. I am a high school art teacher, blogger, crafty, mommy, & Pinterest addict!!! I have 3 daughters that keep me very busy but allow me to create pretty little things for them. 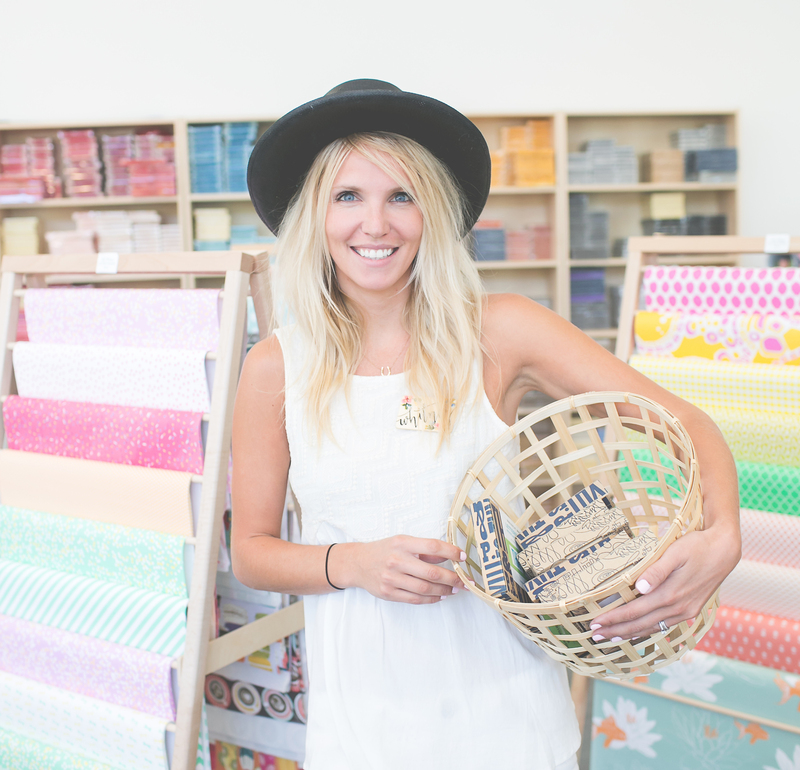 What is your favorite part about working at Paperie + Pen? Love seeing all the different products come in and displayed so beautifully. 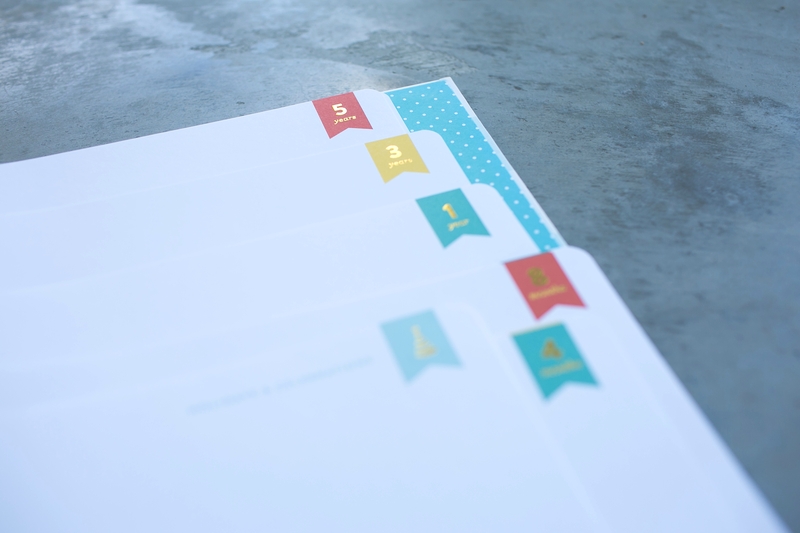 Working on invitation production is always fun to see the different styles, designs, and details. When your are not working, what do you enjoy doing in your free time? Working at the school, anthropologie, spending time with my family, or trying to squeeze in a craft or two. What are 4 superficial things you can’t live without? Favorite Restaurant in the Boise Area: don’t get I go out too much but if i can go to eat without children it’s Barbacoa for sure…if we have the $$ for it. Favorite Movie: I can watch any Disney movie and still love every second of it! Favorite Song/Singer/Band: Taylor Swift, not even gonna lie. I like pretty much all female country singers. Favorite Thing(s) to order from Starbucks: I don’t go to Starbucks… don’t like coffee…weird I know! Favorite TV Shows: Parenthood!! Nashville! Favorite Celebrity Crush: cliché I know but Channing Tatum. What is your best on-hand joke? I hear this a lot so it’s funny to me: Oh your not busy are you?? 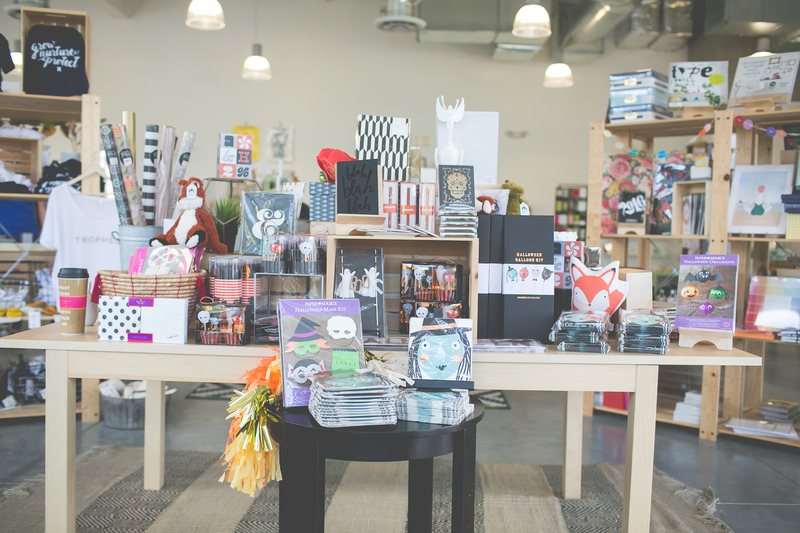 What is your favorite part about working at Paperie + Pen? My favorite part about working at P+P is being just as passionate about the product as the customers are. Every time new merchandise comes in, it’s like Christmas! When your are not working, what do you enjoy doing in your free time? I don’t really have free time anymore because I just went back to college full-time after a 10 year hiatus (yikes) so when I’m not working I’m either doing homework or I’ve fallen asleep reading my textbooks. My favorite part of every day is seeing my pup after a long day. Favorite P+P vendor and why: Favorite P+P vendor would have to be a tie between Garance Dore (I love her style so much!) and Rifle Paper. I love the French, nostalgic and classic vibe from both. Favorite Restaurant in the Boise Area: My favorite restaurant around town is Red Feather. Their brunch is the best and I love their patio scene. What is your best on-hand joke? I have no jokes, eep! 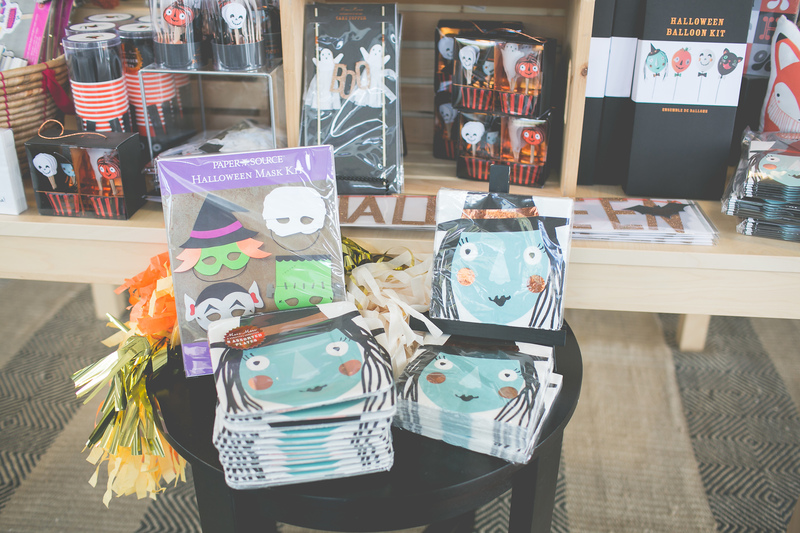 Skulls and Witches and Ghosts…oh myyyy! 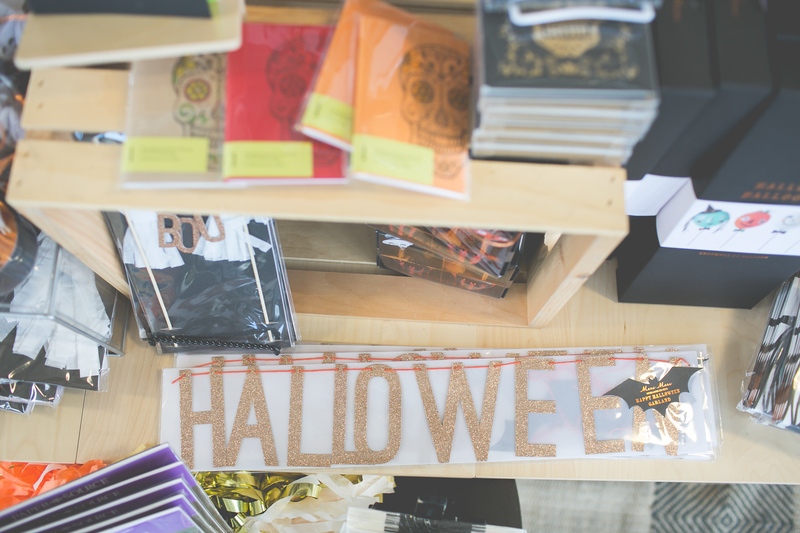 Just a friendly reminder that our Halloween is fully loaded and on-point for your parties! 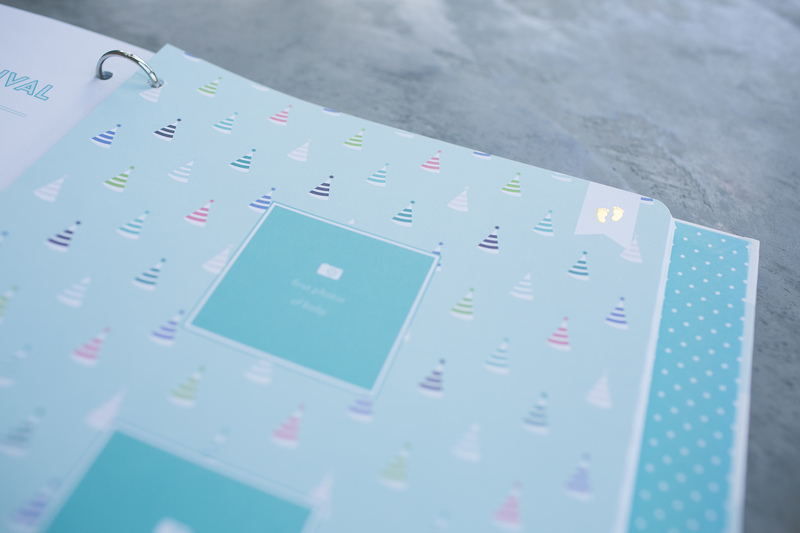 We are dying over all of the adorable Paper Source designs. Come grab yours and start planning those costume parties! We love you girl!! Thanks for being a rockstar. Tell us a little bit about you and your background: I grew up in Boise, then went to Utah State University were I studied interior design. I have worked as an Interior Designer for 10 years and enjoy making spaces beautiful. 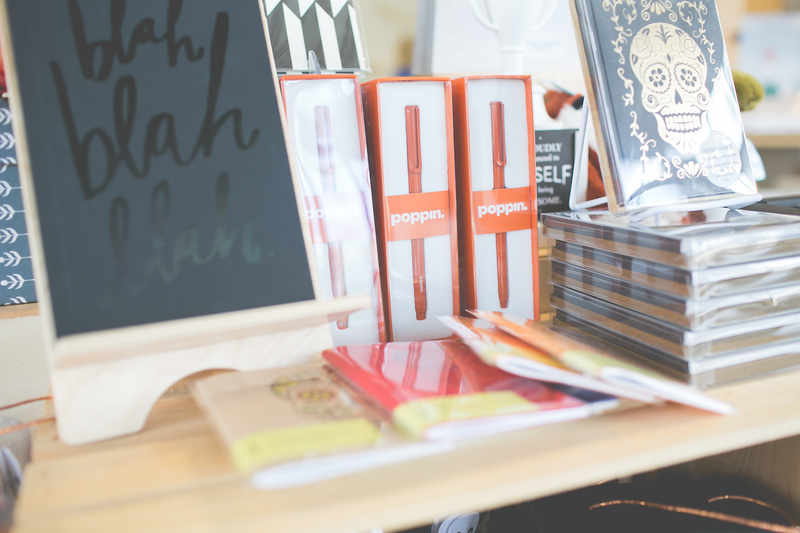 What is your favorite part about working at Paperie + Pen? I love meeting new people! When your are not working, what do you enjoy doing in your free time? Spending time with family! Traveling, reading and spend time with friends. Favorite P+P vendor and why: Rifle. I like the colors, retro feel and flora motifs. What is your best on-hand joke? What did the fish say when it swam into a wall? Dam…what did the dam say back? Dumb bass. This year, I was pregnant with my first child. For anyone who has been pregnant before, you know that basically- it is 9 months of torture, which makes you obsessive. For some, they are obsessed with the nursery. Some are obsessed with naming the child. Some are obsessed with obtaining every possible gadget and doo-dad for the little one. I, was obsessed with ALL of it! With my obsession came documentation. I wanted to document every piece of this experience, the pregnancy, the birth, the baby. Being a wedding photographer, documentation is so important to me- really, it is everything I stand for. So choosing the perfect baby book was imperative. On my search for this “perfect” baby book- I found cute options that weren’t practical, or worse- practical options that weren’t cute. 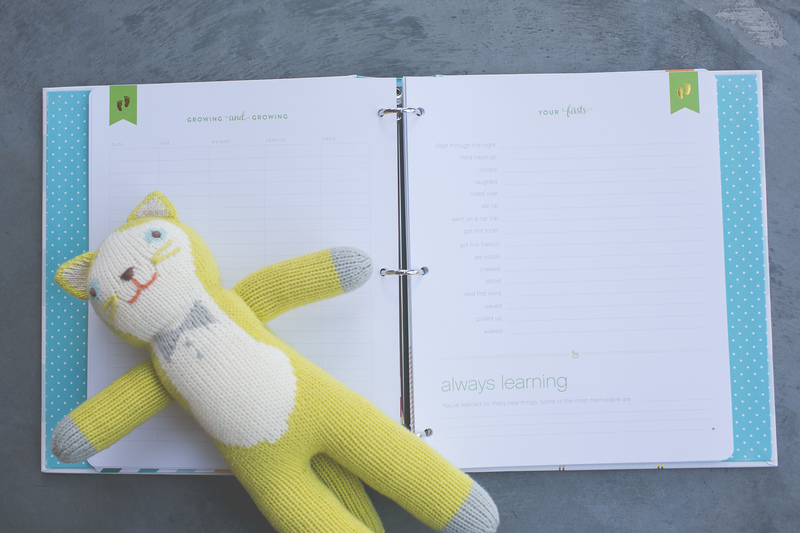 Most baby books are stitch-bound, so it is impossible to add to them or customize them much. 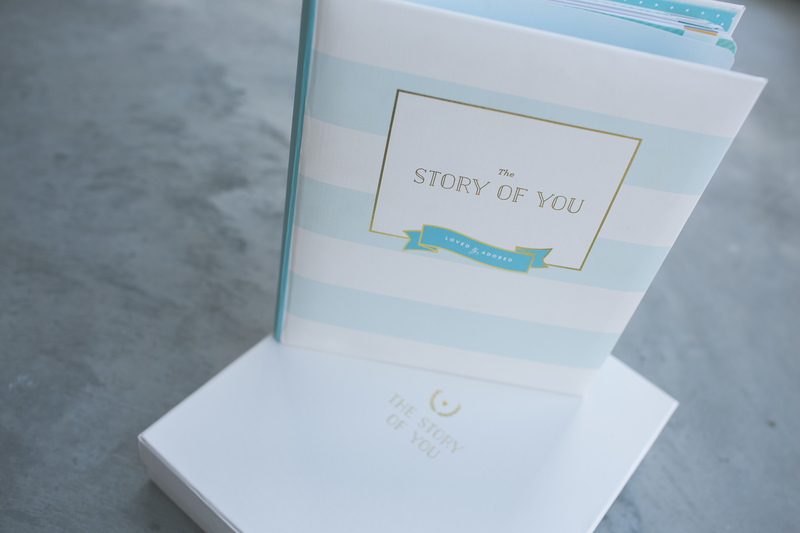 WELL- weeks after finding a baby book that would ‘work for us’, Emily Ley did it again…(if you have ever owned a Simplied Planner, you know what I am talking about) she released a baby book that really had everything I was looking for! – Visually appealing: beautiful, clean design, gold foil on the front and back cover as well as the color coded page tabs, modern but timeless, unisex- so can be bought as a baby gift, or before the gender is determined– and of course it matches the chair in my nursery PERFECTLY. 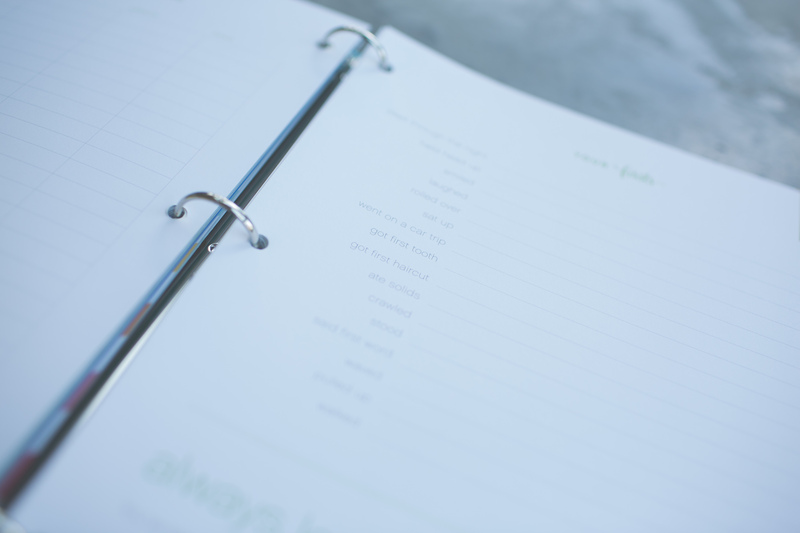 -Practical: the format is a standard size 3-ring binder, so the pages can be rearranged. I love this, because most baby books’ order isn’t always the way that things happen for your baby. 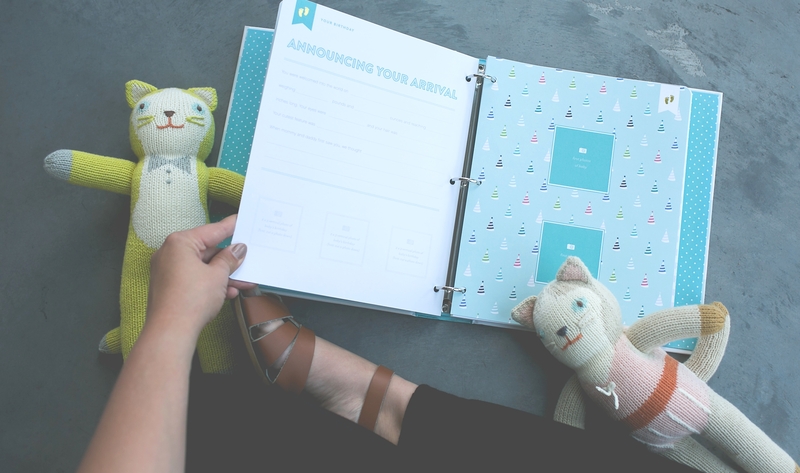 Such as- first haircut page is usually around a year, my baby’s first haircut happened at 9 weeks… with this format, you can put everything in the exact order it happened for your little one. 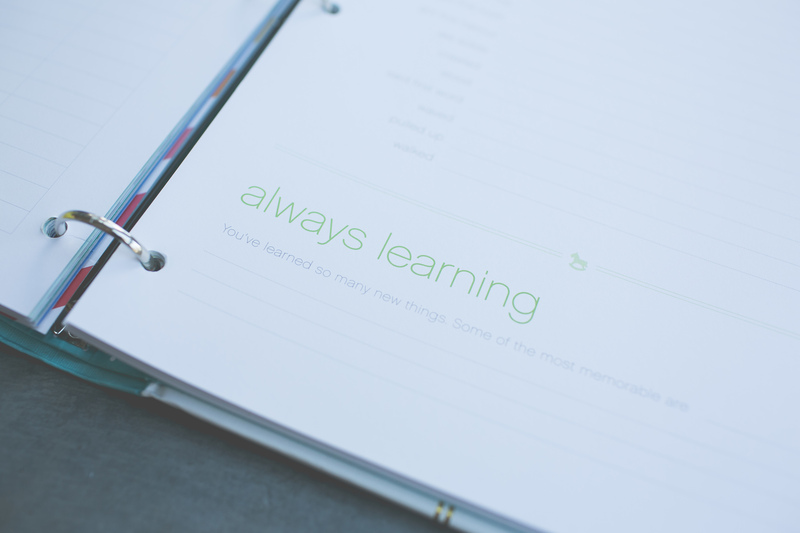 You can also add more pages and it is SIMPLE since you can use a 3-hole punch to add whatever you’d like. So practical. 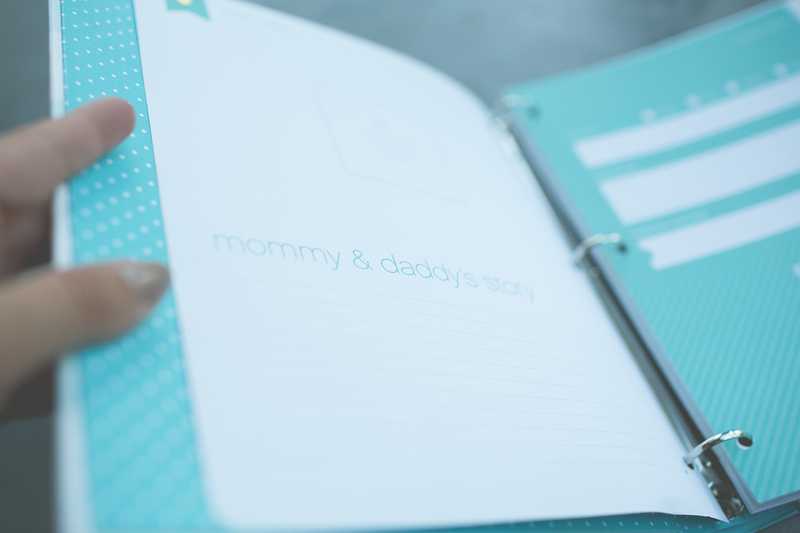 I love keeping everything for my son, but I am a busy mama…so the 3- ring simplifies everything so you can add it to your book right away. – High Quality: I guess this can also double dip into the visual appeal- but the pages are thick but not cumbersome and the printing and gold foil is perfection. It is lightweight- yet durable. And the cover has a lamination that can be easily wiped… just in case tiny, sticky fingers might find their way on their heirloom. When it comes down to it, no child is alike and I think mama EL knows that as much as the rest of us! Her design has so much personality, but so much room to add your own personality and the personality of your little one! The pages included go up to YEAR 5! But with the 3-ring format, you can pack that puppy full of all sorts of “firsts” and photos. Bravo again Emily Ley. Bravo. 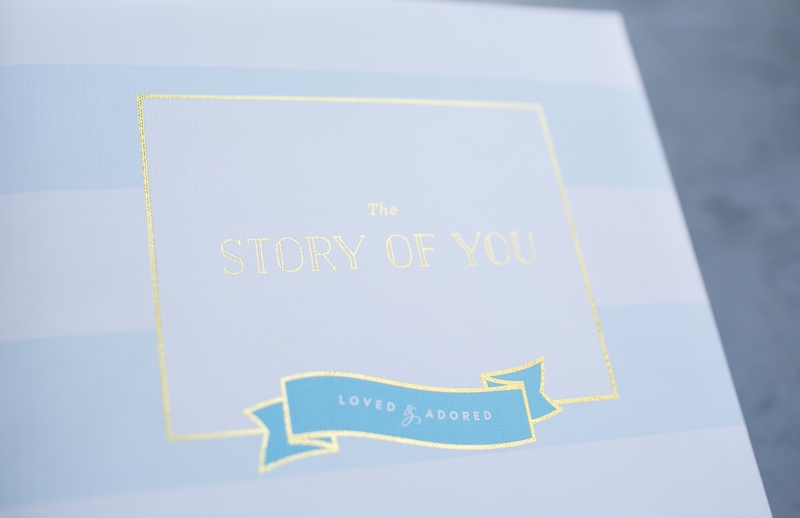 An amazing little promo video by the amazing Darlene Dame from Golden Moments Media! Meet Whitney—she is the crazy ball of energy that is bound to brighten your day! I know what you are thinking, there is no way one person legitimately has this much energy—we assure you, it is legit. Miss Whit is a bloggin, instagrammin, mama of all trades! Just seeing her cuteness in the mornings just makes me NEED to go shopping! Tell us a little bit about you and your background: BSU grad. Lived in California for 6 years. Recently moved back with my husband and 18 month old son, Stetson. Love to laugh, have fun, and talk girl talk. 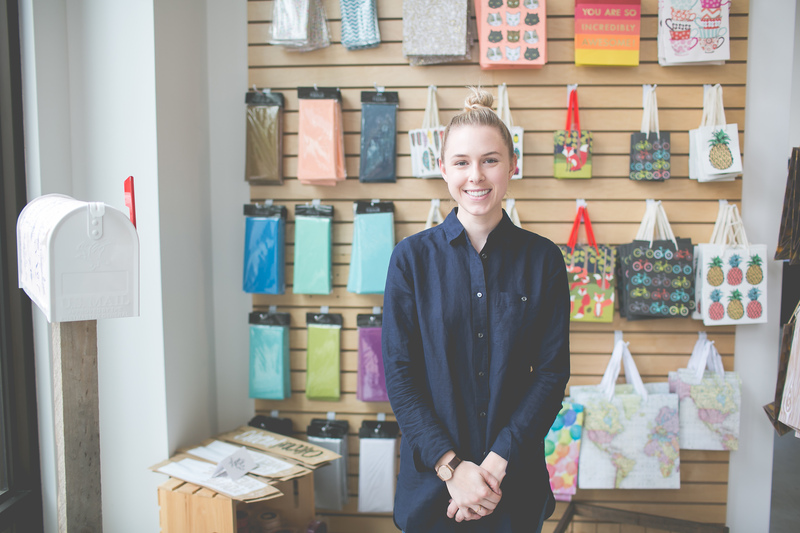 What is your favorite part about working at Paperie + Pen? 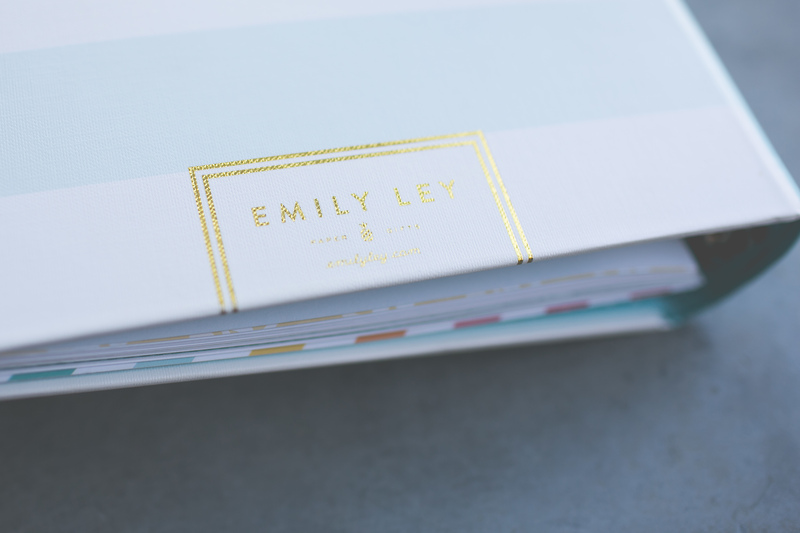 My favorite thing is being up close and personal with so much talent and beautiful stationery. When your are not working, what do you enjoy doing in your free time? What free time? It’s Stetsons world and I’m just living in it. But I do like to stay busy, crafty, bake, read, and I am a huge SUN worshiper. Favorite Restaurant in the Boise Area: I love juniper downtown. Local ingredients and super creative menu. Their kale salad is killer! Favorite Movie: the Philadelphia story. Huge fan of classic movies and Cary Grant and James Stewart are my favorite of all time. Favorite Music: Ellie Golding and Taylor Swift. Girl power and I’m not even sorry about it! Favorite TV Shows: Nashville, American Horror Story and Meet the Goldbergs. Sum yourself up in a hashtag: #EW! 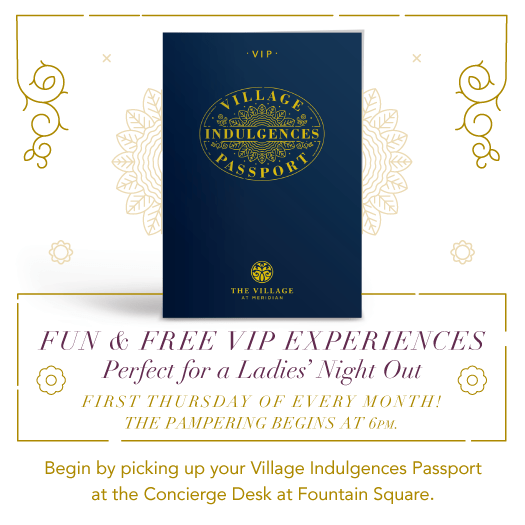 Escape to the Village every first Thursday of the month! Enjoy free activities throughout the Village and loads of shopping perks- including individual short promotions and a $20 Village gift card when you bring $150 in shopping/dining receipts to the concierge! See more details and find out the promotions ahead of time on the Village at Meridian’s website!